Biotech Bonanza: Breaking New Ground & More To Go! Early stages of the rally, with multiple reasons to drive further highs in the months ahead. Key drivers appear to be improving. Exposure to the sector becomes important to outperform the broader market. Biotechnology has started off the year on a strong note, and finally breached a level that presented stiff resistance in the past. The Nasdaq Biotechnology Index, as represented by ETF (IBB), has been consolidating in a trading range for over a year. Past moves up were rebuffed at the 300 index level, while the index found support in the 250 area. This time the Nasdaq Biotech Index has punched through a key resistance level, recording its first 52-week high of a market rally that ensued last August and gained momentum in November 2016. The key question now is whether biotechnology will retreat or can the sector build on its gains? It is our belief that the sector will consolidate around its new 52-week high and will add to its gains, particularly in the first-half! The pendulum has swung in the other direction, in favor of biotechs, and Biotechnology is poised to become a leading sector heading into 2017." "Sufficient biotechnology sector drivers now exist to create momentum for a breakout. Biotechnology indexes to make 52-weeks highs in the first quarter and deliver further gains beyond." Biotech is truly off to a strong start this year with the representative Nasdaq Biotechnology Index (IBB) up +12% as of the end of February, and our Prudent Biotech Portfolio up +26%. However, the strong start in 2017 has to be kept in perspective with the dismal performance in 2016 when biotechs lagged the broader indexes, S&P 500 (SPY) and Nasdaq Composite (QQQ), by around -30% and the small cap Russell 2000 (IWM) by nearly -40%. Moreover, while the broader indexes have continued to make new all-time highs, the biotechnology index will still have to climb about +30% from its present level to achieve a similar milestone. It appears to us that Biotechnology now is in a sweet spot. Risk appetite in the market is strong and capital is being attracted to a sector that significantly underperformed last year but has an improving risk profile this year. This present biotech rally is in its initial stages and, in our opinion, has the endurance to persist. The grip of price-control regulation that has paralyzed the sector, appears to be easing. The pharmaceutical and biotechnology sectors have been under a cloud of regulatory uncertainty for a year as highlights of egregious price increases by firms have dominated the public and political health care debate. This growing outcry in what is a self-inflicted wound is now creating a shift in the industry towards price self-regulation by major firms. Few of the companies that have pledged to keep annual price increases restrained and transparent include Regeneron (REGN), Allergan (AGN), Novo Nordisk (NVO), AbbVie (ABBV), Johnson & Johnson (JNJ), and Alkermes (ALKS). President Trump has been equally vociferous and has made multiple statements promising to bring down drug prices. He has even raised the specter of providing a price-bargaining ability to Centers for Medicare and Medicaid Services, a policy change that the industry finds highly inimical. To be clear, diminishing risk doesn't mean the risk is non-existent. The pharma industry will wear the pricing albatross around its neck for many quarters to come, till self-regulation minimizes the instances that appear as price-gouging, and broader measures assist in decelerating price inflation. Already, a drug importation bill is once again coming back this month to allow importing cheaper drugs. It's co-sponsor - the indefatigable drug price activist, Bernie Sanders. But the shift towards self-regulation and the appearance of Trump focusing on the drug-approval process instead of price-regulation to bring down costs has begun to billow the erstwhile limp sails of the biotech sector. The sensitivity to dramatic price increases remains very high, and the industry and investors are learning to manage and live with it for now. 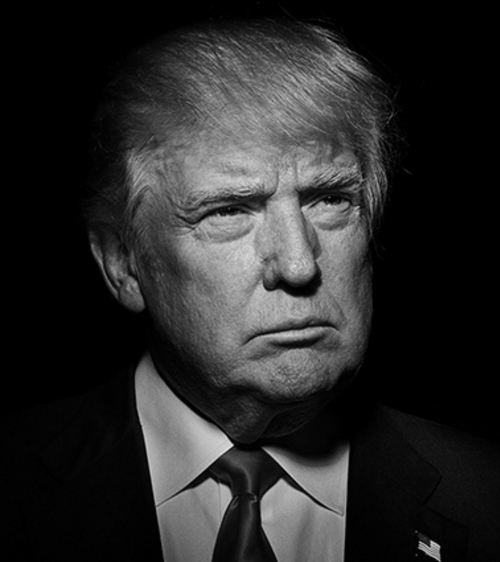 Trump is proving to be a catalyst for the industry, as was discussed in the article, Biotechnology: Can Trump Be A Catalyst?. The objective of speeding up the drug approval process is a good exercise which can deliver significant value to both the consumers and drug developers, particularly biotech companies. The new FDA Commissioner has not yet been appointed and is expected to be someone who will be given the goal to work towards a less onerous drug approval process. However, while streamlining the process and eliminating anachronistic and ineffective rules are laudable goals, a comprehensive deregulation mentality at the agency may jeopardize the balance that must be maintained to not compromise the sanctity of the drug approval process. In the hunt for "burdensome regulations" to eliminate, the agency under new leadership must not compromise its own effectiveness in safeguarding the health of the populace. This is obviously a hot-button issue with conflicting interests. It is interesting to note what the industry has been thinking about this subject. 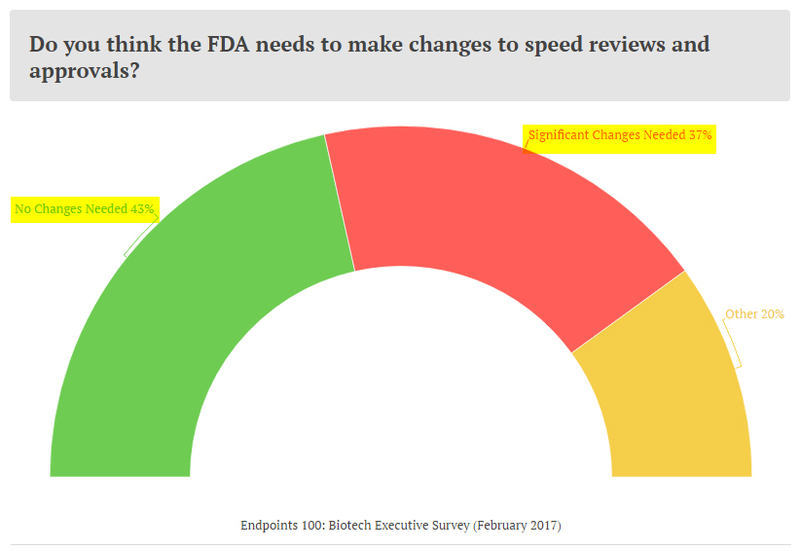 In a recent February survey by Endpoints, a leading biotech media site, a majority of the healthcare executives at top firms felt that the FDA approval process does not require a major overhaul. Nonetheless, it cannot be disputed that any responsible streamlining of the drug approval process will be of significant benefit to the biotechnology industry. 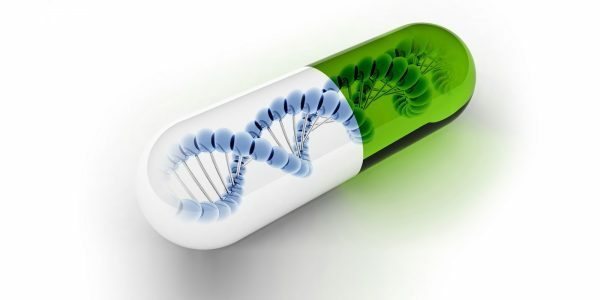 As a side note, it is interesting to note that as technology advances, the industry is coming up with innovative solutions and a case-in-point is the virtual trial offering being tested by Sanofi (SNY). A meaningful portion of drug approval costs is embedded in the trials. Efficient trial management can assist in bringing down the costs. A rising market leads to growing M&A activity. One of the reasons is that acquired growth also receives the higher multiple. This will be generally true for the biotechnology sector as well. But even more of a compelling driver is the search for new product lines by pharmaceuticals and large biotechs, which will continue to spur M&A activity and partnerships. The above discussion of a regulatory climate and price sensitivity feeds into the argument for an active M&A environment. As price increases at the large pharmaceuticals begin to whittle down due to general industry awareness and Trump's battering, the industry is left with innovation as its savior. Innovation can be spurred through acquisitions. Gilead (GILD) has been seeking a meaningful acquisition candidate and is consequently rumored to be part of many potential deals. Other big biotech companies like Biogen (BIIB) and Amgen (AMGN) are also on the hunt for acquisitions, while Celgene (CELG) has been spreading its partnerships investments in many promising companies for quite some time now. Incyte (INCY), a fairly large $22 billion biotech, is in fact rumored often to be in the M&A crosshairs as a target for larger biotech and pharmaceutical companies. At the same time, large pharma like Pfizer (PFE), Johnson & Johnson (JNJ) and Sanofi seem eager to acquire. Japanese pharmaceutical giant Takeda Pharmaceuticals, after its recent acquisition of Ariad Pharmaceuticals (ARIA), remains on the lookout for more transactions. Recently, Takeda also partnered with an investment group to participate in deal flow in early-stage biotechs. The potential M&A activity provides a valuation support to the biotechnology sector. Biotechnology is a relatively small sector with less than 500 companies, excluding micro caps, and most of them being small-and-mid-caps. This segment has been relatively outperforming the larger cap biotechs, as evidenced by the performance of smaller-cap S&P Select Biotech Index (XBI) compared to larger cap Nasdaq Biotechnology Index, and most often represents the targets that the larger companies are after. Our 8-stock Prudent Biotech Model Portfolio mostly has stocks in the small-and-midcap segment. In our earlier reports, including the one titled Is 2017 a Bonanza year, we had listed some promising opportunities. At this point, such opportunities include Incyte (INCY), Tesaro (TSRO), Ionis Pharmaceuticals (IONS), Alkermes, Ultragenyx Pharma (RARE), Exelis (EXEL), United Therapeutics (UTHR), Sage Therapeutics (SAGE), Array Biopharma (ARRY), Clovis Oncology (CLVS), Loxo Therapeutics (LOXO), Fibrogen (FGEN), Xencor (XNCR), Supernus Pharmaceuticals (SUPN), Achaogen (AKAO), Acadia Pharmaceuticals (ACAD), and Esperion Therapeutics (ESPR) to name a few. Biotech exposure can also be acquired through ETFs like iShares IBB, S&P Spdr XBI, and leveraged ETFs like (LABU) and (LABD). The dilemma for a new investor is that many biotech stocks have made strong moves this year. It will be harder to find names that are still not reflecting the optimism for the sector's prospects in 2017. At the same time, as discussed above, it is our opinion that the rally has room to run, and the first-half will be stronger than the second. We discussed this in greater detail in articles Buffett Sees It, and Market Outlook 2017. We were anticipating a pause and consolidation during March due to the market underestimating the probability of a rate increase later this month. However, this appears to have corrected itself over the past week, with the market now anticipating an 80% probability, up from ~30%, for a rate hike. Exposure to the biotechnology sector has become quite important this year in order to outperform the broader market. This should trigger additional capital flows into the sector. Our overall bullishness on biotechs has made us increase the sector exposure in our Graycell Smallcap Portfolio, which was up +71% in 2016, to 50% of the invested portfolio. We recalibrate our model portfolios each month based on market conditions.